Another busy weekend has prevented me from putting together my next planned Inventor Publisher video. I promise to get one out as soon as I can. I can at least see the light of day with my current projects, and I'm pretty sure it's not an oncoming train! But on a "tangent blog", I thought I'd share an anecdote picked up from my volunteer work at Planes of Fame in Chino, Ca. I recently began learning out to recover control surfaces in fabric. That's right. 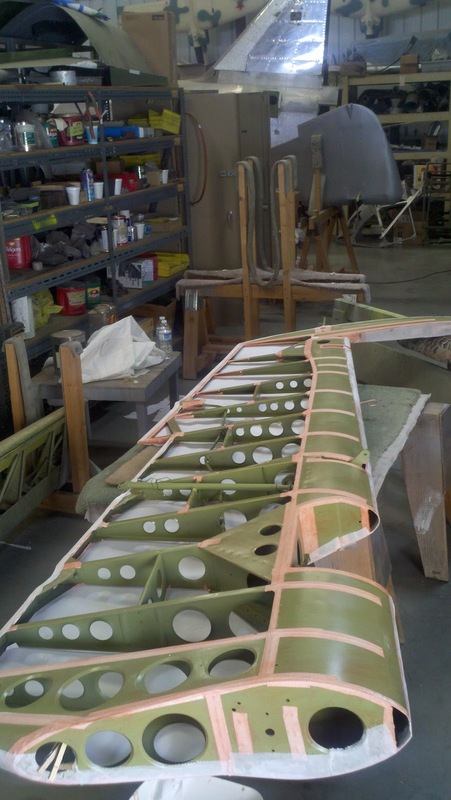 The old school cloth and fabric rudders, ailerons, and elevators. My first assignment? Not a trip to the shop to get dirty. Start reading the manual. Get familiar with the process, so you know what we're doing, and why we do it. After that, I finally after a couple of weeks, I got to start working on a real project. 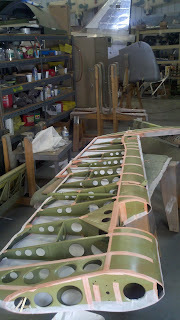 The rudder of a TBM Avenger. The rudder of the Avenger looking from the bottom up. The first thing I'm told before we start looking at it? "This is more art than science." We begin working. Actually, they're doing more working, I'm doing more watching. 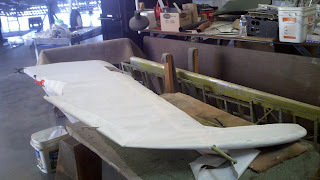 But I'm learning the art of tugging, stretching, and; cutting the fabric to fit around the curved surfaces of the rudder. As the project progresses, the team stands up and studies a compound curve. They discuss whether or not the material will shrink around a given bend when heated. If it should be cut instead, and if so, where it has to be cut, and how many cuts are required. And if we cut the fabric, here, that's going to have an effect two steps down the line, so that has to be considered too. It's an exercise in patience and planning. So why would I put this in a blog? This is about CAD software, not about seventy year old warbirds. I put it in here because the planning of the project is as important as the process, maybe even more important. Even the veterans of doing this have to check the manuals, stop and talk over a step in the process, and even step a way for a few minutes to pace around the hangar until inspiration comes. (These are referred to as "coffee breaks"). Starts sounding a bit like an implementation, or maybe an installation or software upgrade, doesn't it? So that's where my observations are this week. A reaffirmation of all those times that I've wanted to charge ahead, get 'er done. All those times I've wanted to "make it happen" so we can get to happy hour and high five for a job well done. The same rudder, a little bit closer now. 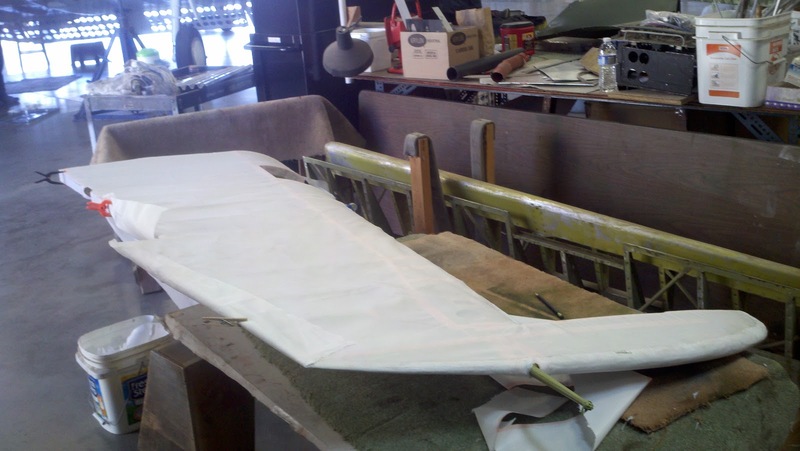 What did I learn from those guys stretching the fabric on a 70 year old Avenger's rudder? The experts know what they know, and they also know what they don't know. Don't neglect your planning. And when you think the planning is done, self check yourself as you go forward. You never know when you may learn a better way to do things. And on that note, here's the aircraft that rudder belongs to. This video was recorded when it flew at an event last year. I am not a Air Planes freak as you Nor have much knowledge. But want to share this. In a little airshow in Georgia, I saw a stunt country plane. The pilot had this plane sitting on a huge truck. Took off, did some great acobatics on air and landed in a great style. For landing the guy on the ground drove the truck on the run way. The pilot lined up the plane with truck and lowered slowly. Eventually landed on the truck ! !